The piece below was originally published on June 30, 2011 as a guest post on a website that is no longer available. It had a different quote-photo attached to it at the time, which you can find here. I made a new quote-photo in honor of Dr. Angelou, who died this morning, may her memory be a blessing. Her poem was the starting point of my own journey towards radical self-acceptance. I am grateful beyond compare for her words and her wisdom and for her light, which shone brightly in a world that seeks to dampen the lights of women and especially that of women of color. I was blessed to see/ hear her speak when I was a young adult, and her even though it was one of the largest readings I've ever been to (held in a basketball arena! and packed, full to the brim!) her spirit and voice carried, making me feel that she was sitting right next to me. 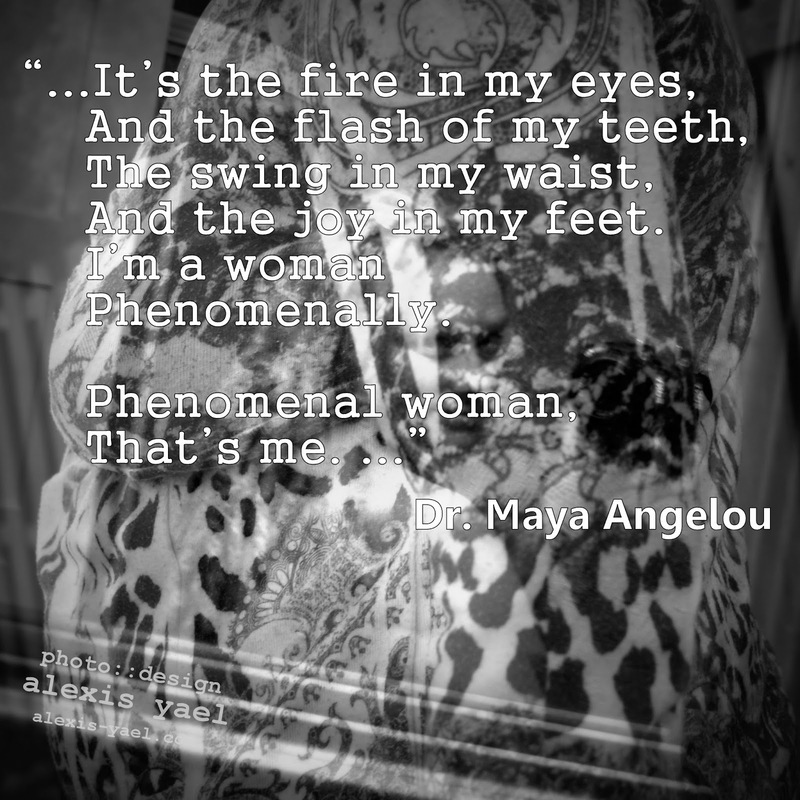 Just as the persona in her poem, her real life persona commanded attention, for she was truly a phenomenal woman, a phenomenal human being. You could feel the joy and the honesty radiating from her being. She loved herself and she loved the world. May the words of my heart and the meditations of my soul be a fitting tribute to her life's work. Thank you, Dr. Angelou. Thank you. Thank you. There is no way to love yourself but to be embodied in the body you have. The wicked smile that shows the gap in your teeth. The feet you think are too big, or too gnarly, or too wide that carry you towards the people you love. The waist you think is too thick, which supports your whole body. To love that body, to be grounded in the awareness that this is all there is and it really does not get any better (except occasionally by choice and work). When you embody love like that in your life, you have plenty of love to spread around. YOUR BODY is phenomenal. Just the sheer effort it took for the ova and the sperm that make up your genetic blueprint to meet and go through the full permutation of fertilization and growth to create you is amazing and miraculous. (Just ask someone who has ever had to try hard to conceive!) Your body is unique and amazing, despite and actually because of your limitations! Your little “imperfections” are what make you, you. YOUR body. Yes. Yours! Whether your spoons are depleted or full. Whether you’re flat on your back after a day of pain or ready to catapult yourself into a marathon. YOUR BODY is phenomenal. Can you imagine Frida Kahlo without the mono-brow (so gorgeous) or the wracked-with-pain body that caused her to have gave her the inspiration to paint self-portraits? I wouldn’t wish that kind of pain on anyone, but it was her pain that gave her us the amazing gift of her art. Yes, if she hadn’t been in the trolley accident she would still have had an amazing life (perhaps as the doctor she wished to be instead of as a painter), but what happened happened, there is no use trying to turn back the clock. We can’t do that for her, except perhaps in fiction, and we sure as hell can’t do it for ourselves, either. Frida’s body was beautiful. Her many lovers could attest to that, I’m sure. When you’re strongly sure of who you are, what you value and love, you become insanely beautiful to everyone who you love and who loves you. You don’t have to “like” your body. You have to be crazy in love with it! You have to treat it like you’d treat your most amazing lover. Feed it with the choicest foods. Drink enough water (and other liquids) for health and well being. Clothe your body in splendor, with fabric that pleases your touch, with colors that excite and move you. Touch yourself in ways that you would touch your lover (yes, I just went there. Indeed. There’s a reason it’s called “self loving.”) Don’t be afraid to love this body! This moment is the only one, do not run away from it thinking you will find a way to love your body after you lose twenty pounds or your youngest child is in college, or your mate decides to shower you with desire. It won’t happen then if it doesn’t happen now! So, be crazy about your body now. In this moment. Take a second to breath and enjoy the air filling your lungs. Even if you have asthma or allergies (like I do) your lungs are still doing crazy-amazing things every moment. Take a second. Give thanks. For this breath sustains you and allows the moment to continue, for as long as it will. Fall in love, crazy love, with your body every moment. Be grounded in love and love will be grounded in you.